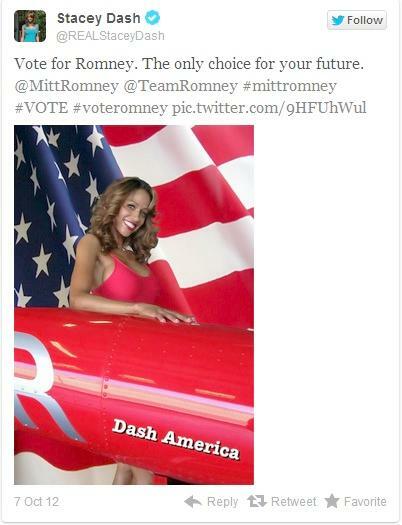 Well all hell broke loose when former 'Single Ladies' star, Stacey Dash, tweeted her support for Mitt Romney. Now given Dash's fan base, she had to know she was taking a calculated risk making this announcement, but the 'Clueless' star chose to go forward with it anyway. To say her announcement didn't go over well was an understatement. People tore into the actress on Twitter. Given the fact that most of her fan base are also President Obama's fanbase, she had to expect this one would think. But then again, you never know with Stacey Dash. She must be high ...Either that or she's just plain crazy. Perhaps she felt that Romney ideas closely matched her political views. She is entitled to her opinion. What happened to disagreeing respectfully. However, if an actress who needs a audience approval / popularity to stay employed....that was a poor decision. To call her crazy is a stretch.